As employees are completing and filing their Federal income taxes, this is often a time for them to review their Form W-4, Employee’s Withholding Allowance Certificate. 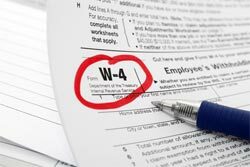 Although it is tempting to offer advice to your employees concerning how best to fill out their W-4, you should resist that impulse. There are many resources available for employees to understand how best to fill out their form, starting with the instructions on the top of the form. The American Payroll Association also recommends that employees read IRS Publication 505 for a detailed explanation and worksheets to assist in calculations to fill out the form. The latest version of the publication is available at http://www.irs.gov/uac/Publication-505,-Tax-Withholding-and-Estimated-Tax-3 . Without offering advice to your employees, however, there is a special situation that as an employer you should be versed in. I claim exemption from withholding for 2014, and I certify that I meet both of the following conditions for exemption. Being a full-time student and a dependent does not automatically exempt a part-time employee from withholding requirements. When total income (both wage and non-wage income) exceeds $1,000 and includes more than $350 of unearned income (interest, dividends, etc.) per year, an employee who is being claimed as a dependent by their parents (or someone else) cannot claim exemption from withholding. Otherwise, the total income tests mentioned above apply. “You may have to pay a penalty of $500 if both of the following apply. You make statements or claim withholding allowances on your Form W-4 that reduce the amount of tax withheld. You have no reasonable basis for those statements or allowances at the time you prepare your Form W-4. There is also a criminal penalty for willfully supplying false or fraudulent information on your Form W-4 or for willfully failing to supply information that would increase the amount withheld. The penalty upon conviction can be either a fine of up to $1,000 or imprisonment for up to 1 year, or both. A careful reading by the employee of the instructions and other supporting materials will result in a properly completed W-4 and no surprises next year at this time.